A long while back I met the lovely lady who would eventually agree to bind our fortunes and fates to pursue a life together. Luckily for you this story has nothing to do with that. Except for the fact that shortly after we met I helped her pick up a new bike. 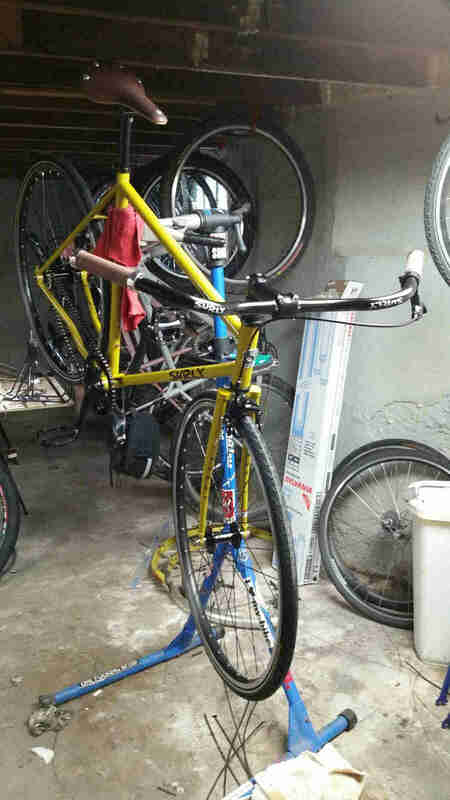 It was a “fixed gear” that a friend at a local bike shop had assembled for her from a refurbished frame and used parts. I rode bikes a fair amount but had no idea what this “fixed gear” thing was all about. I did a little research and became intrigued. Now this was before those things blew up all over the place and seemed to be available everywhere. If you wanted a fixed gear but didn’t want to pay the price for a legit track bike you had to get creative and put it together yourself. I got myself over to the same shop where my partner in crime had gone. I fell in love with a faded pink Shogun road frame and fork. It was my size. It already had a bottom bracket and crankset installed. I bought it for $25. Saying that $25 was well spent would be an understatement. For less than the cost of three good pints and an honest man’s tip, I was not only hooked on riding fixed but also turned on to the whole single-speed thing. That Shogun fixie became my main ride. I eventually added fenders and a rack. I commuted thousands of miles year-round on that bike. It served me well until I T-boned a steel fence stake one night while cutting through a construction zone. That left my fork bent and downtube crinkled. Fortunately, my good friends, Tuck and Roll, helped me up and brushed me off. I was remarkably unscathed, but the frame was toast. 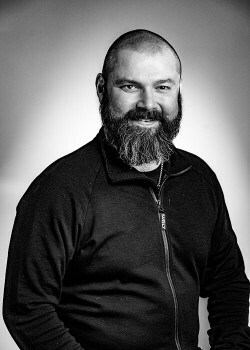 By that time I had begun working at QBP, the parent company of Surly. Instead of seeking out another old road frame I got a Steamroller frame and built it up. I loved it. But there was too much static caused by working at a big bicycle toy store. There were race bike projects. (Yep, I used to do that.) There was my first Cross-Check (another life altering experience). There were mountain bikes. There were all manner of shiny new rigs – many with gears, that is – to distract me. I’m not going to lie. 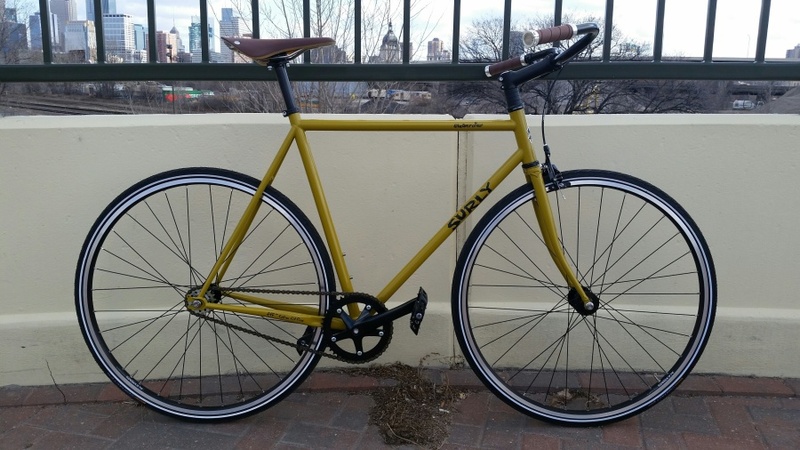 I missed that old Shogun fixed gear with its more laid-back geometry, rack, and fenders. 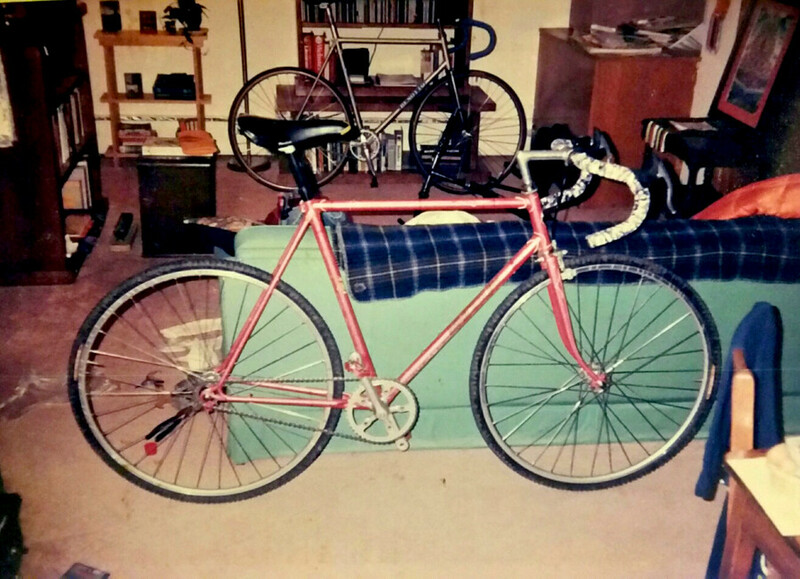 Perhaps out of nostalgia I built a fixed-gear Cross-Check. My Steamroller got stripped for parts and the frame was bartered to a co-worker. I’ll be the first to say the Cross-Check makes a damn fine fixie/single-speed. But it’s no Steamroller. Too little maintenance over the course of too many winters relegated that Cross-Check to the rebuild rack. It’s embarrassing to admit that rebuild has taken more than two years. In part because during that time along came Krampus, Straggler, and Ice Cream Truck to keep me sidetracked in my explorations. And I’m no less happy a person for those distractions. Mostly. When I saw this newest Steamroller complete coming along though, something clicked. It was time to get back to basics. Time to write a letter to an old friend. 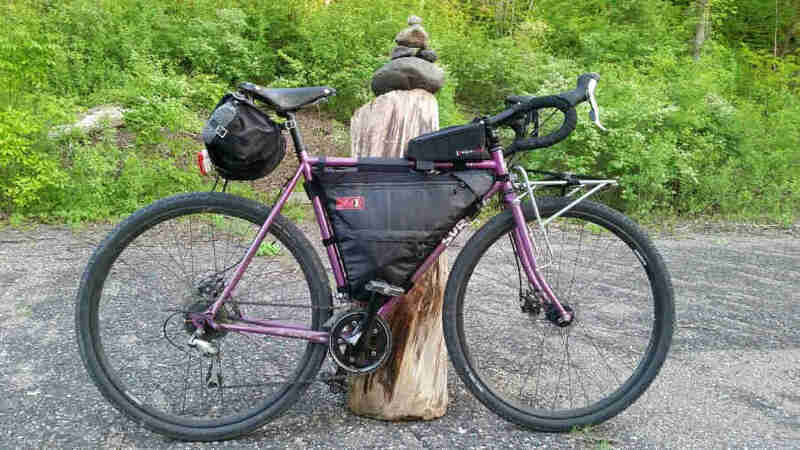 I was ready, again, to have a bike that isn’t outfitted with frame bags, racks, and all the other fun entrapments that adorn the majority of my other rigs like Straggler. Indeed it was time to get back to basics, so I got a Steamroller complete. I made a few changes to the stock build while assembling this new bike. I will point out just a few. One of the reasons we spec our bikes the way we do is that we celebrate Surly owners putting their own special mark on their personal rides. As many of you know the sky is the limit when it comes to customizing a bike. Our stock bikes are a solid foundation of durability and utility for you to build upon as you see fit. 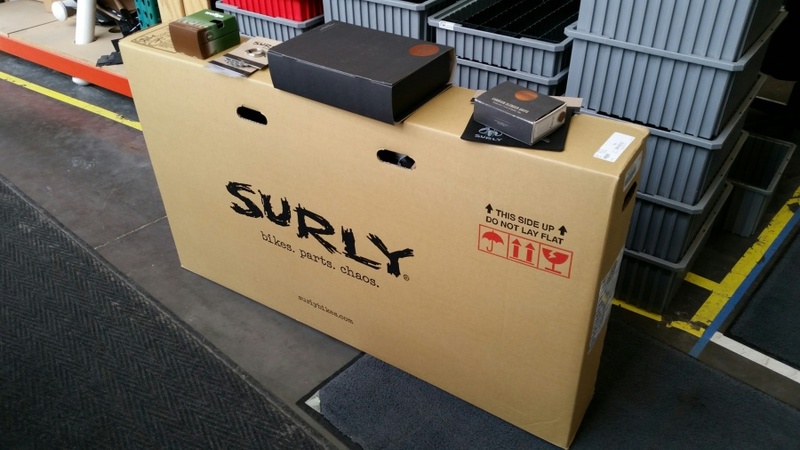 But first, most people never get to see how their Surly bike arrives at their local bike shop. It’s not all that spectacular unless you really like cardboard boxes. However, I am a fan of the new logo that is screened on our bike and frame boxes. It used to be a plain block font. In fact, you might see bike box cutouts transformed into signs at your local bike shop! Note that forks do not come installed on our bikes. The steerer tubes are left uncut so the stack height can be dialed in for optimum fit. We’ve been doing this for over five years now. 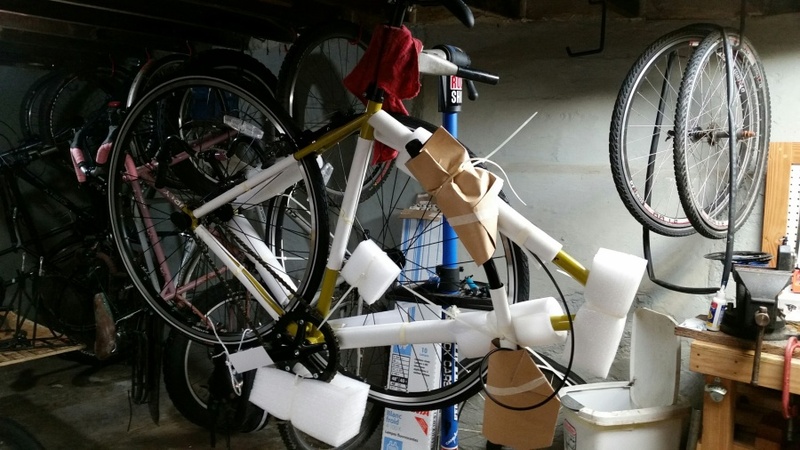 In addition, some other assembly is required including headsets, cable routing, brakes, and derailleur adjustments. 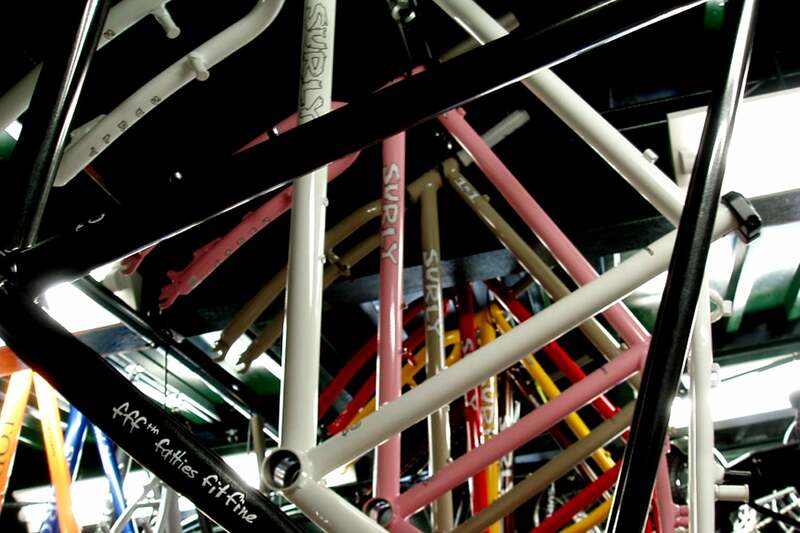 Your local bike shop has done a lot by the time you take possession of your shiny new Surly. Tip them a 6-pack won’t you? I substituted some parts while assembling the bike. First and foremost I “fixed” it by removing the stock freewheel and utilizing the other side of the flip-flop hub shell to install a track cog and lockring. That does not come with the Steamroller complete but it’s an easy enough conversion. I’m a Brooks fan, so I opted to switch out our stock saddle and grips. I’m an Open Bar fan, too, after having ridden them on a Karate Monkey for years. I substituted one of these for our stock flat bar. The hand position is comfy and the rise dials in the fit nicely. Later on, if I change my mind, I can always change the bars back. Pretty cool how that works. Pro Tip: Component changes like these are something your local Surly dealer will be happy to discuss with you! I'd ridden less than a hundred feet on this new bike when it hit me why I'd missed it so. I’m not going to get all sappy on you. But I have to say one thing. It's about the silence. There’s no drivetrain noise. No noise at all save for the subtle hum of 32c tires on pavement. No clicking shifters. No reeling sounds. No dangly bits. No baggage. Just a rider on my bike going anywhere I want to go.